In a small bowl, combine the yeast granules with the 1 teaspoon of sugar and the lukewarm water (make sure it is not cold or hot, or the yeast will not react). Stir, let it sit in a warm area of your kitchen with no wind drafts, and after a few minutes, mix to dissolve. Let it sit again (in the same place) for a couple minutes more, until the mixture has reacted and looks frothy on top. Incorporate 1 cup of the flour and mix well. Cover with a clean kitchen towel and let it rise for an hour. In a mixer fitted with the paddle attachment, beat the butter with the 2/3 cup sugar on medium speed until soft and creamy. Reduce speed to low, add yeast mixture along with the egg yolks, 2 eggs, the rest of the flour, and a pinch of salt. After a few minutes, switch the paddle attachment for the hook attachment. Let the mixer knead the dough on low to medium speed for about 10 to 12 minutes, until the dough is very soft, smooth and shiny, and you can gather it into a ball. Butter a large bowl. Gather the dough into a ball and place it in the bowl. Cover with a clean kitchen towel and place in the warm area of your kitchen with no drafts. Let it rise for about an hour until it doubles in size. Pre-heat the oven to 350 degrees Fahrenheit and butter 3 baking sheets. Uncover the dough and punch it down. Divide it in half, and consecutively halve the pieces until you have 16 pieces of dough. Roll each one into a ball and set on the buttered baking sheets. Place in the warm area of your kitchen for 45 minutes to an hour for a final rise. In a small bowl, beat the remaining egg with a tablespoon of water. Make a 3 slashes on the top of each bun and brush with egg wash. Bake for 20 minutes, until cooked through and browned on top. Also what do you think about making this with whole wheat flour? Or maybe a mixture…60/40? Hi Jasmine! It is very light and fluffy a bit like a brioche or challah. Hey Pati, this is Cathy, can you freeze this dough if you don’t want cook them all….if you can….how would you go about freezing the dough…? Thanks. You can, Cathy! Just let the frozen dough thaw at room temp for a few hours. Last night I made pan de Yema and it turned out beautifully and delicious. After watching the episode where you introduced it, I was inspired to make my own. I made the bread for my family and a special family friend. They all enjoyed it with Mexican hot chocolate. Thank you for being a great chef and teacher. I’m so happy to hear you were inspired, Mar…and loved the bread! I saw your show making the Pan de Yema and would like to try it myself but I do not have a mixer like yours. Can this recipe be done with an electric hand mixer? Would I have to kneed it after I am done with the mixer? If so, for how long? You can mix by hand, Norma. You are looking for the dough to be very soft, smooth, and shiny. You should be able to gather it into a ball when it is done. Enjoy! I made this bread with my 1 year old today and it was delicious! My little girl and I watch your show so often that she dances everytime the theme song comes on! Oh how cute, Priya! Please say hola to your little girl for me. Me podrian dar la receta en espanol gracias. Can you mix this in a bread machine and let it rise, take it out for the second rise? Yes, exactly! Enjoy the bread Maria. My mixer has no paddle attachment, and I usually make by hand. What should I look for when doing by hand? You want the dough to be very soft, smooth and shiny. And you want to be able to gather it into a ball. Have fun making the bread, Lisa. Sure! But cool them for a minute or two less. What is the nutrition info for a serving ? How many calories ? Creo que pudo haber sido el clima… tal vez les falto un par más de minutos en el horno! Can I prepare the dough the night before and have it rise in the refrigerator overnight? Yes you can. Do the first rise as normal and then for the second rise put them in the fridge overnight. Thank you for trying my recipes, Jennifer! LOL – what do you do to use up all those egg whites? Great recipe Pati! Thanks for sharing. My kids and I really enjoy your program. They inspire me to cook Mexican dishes. Always tasty. 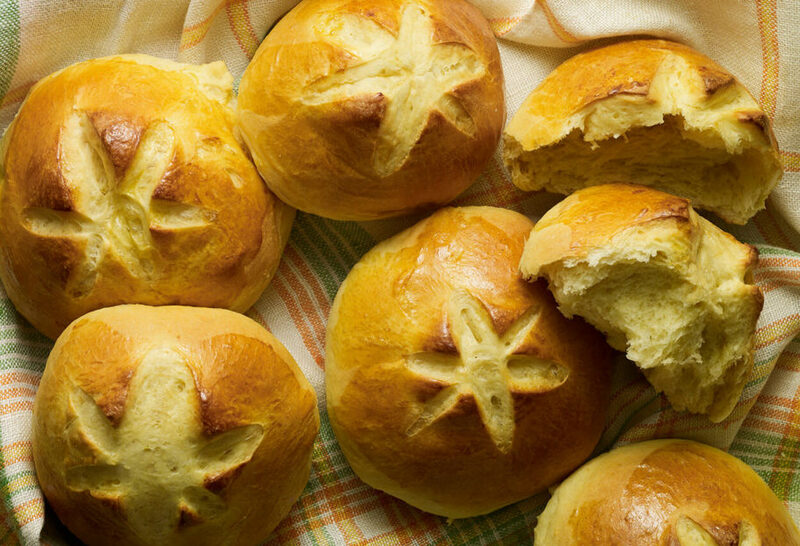 It’s true that these buns are not very sweet, but just enough to accompany a nice homemade hot chocolate or to make savory with a spread of butter. Muchas bendiciones y éxito! It makes me so happy to hear that you are inspired to cook more Mexican food, Jennifer! Thank you! Love the recipe! I added ground canela sticks and vanilla into my batch and they taste just like the local paneria store. To those who may not be accostomed to Mexican sweet bread some are very subtle in sweetness. What a treat! On Sunday morning, I had a tradition of taking cinnamon rolls to church for coffee hour. This recipe is so much easier and better received. There’s no icing, they are neat to tear apart and eat and easily put together without all the fuss of my rolls. This Sunday, my husband and I have the flu. Throwing the ingredients into my bread machine, letting it whirl, then proofing in my big “bread bowl.” Warm, sweet rolls with strawberry jam and cinnamon butter was the “best medicine” that we had all week. They are great dunked in strong sweet tea. Being able to use my bench scrapper instead of my rolling pin seals the deal. Thanks, again. Thank you for this recipe! I can’t wait to make it and dip some in my chocolatito caliente! Yum! Yay! I hope you like it Christy! What an a amazing recipe. I think the secret is not to rush the proofing. The resting time allows the yeast flavor to develop. These are great to take to church for coffee hour because they are delicious, easy to eat, nut-free, enjoyed by seniors and kids, non-messy and the second proof was done in the refrigerator overnight, baked in the morning. Thanks, Pati. Great recipe. So happy to hear this Elizabeth! Everyones tastes are different, but I agree with the general consensus in the comments: it needs more salt. To anyone trying this recipe, it can seem quite bland if you follow it as is. Considering it’s 6 cups of flour, 11 eggs, and 1 cup of unsalted butter; 1 tbsp of salt may help bring out the flavour more. Regardless, thank you for sharing your recipe Pati. Your show is fun to watch, and keeps me inspired to cook. Has anyone tried to reduce this recipe? We are only 3 people and I would like to make a third of this recipe. I baked this twice in the last two days as a special request for my mom. To me it was definitely missing more salt a pinch for this recipe was too little therefore I added 1 tsp. I also made my second batch with a condensed milk filling which made this recipe fantastic! Miscommunication with my mom she actually wanted torta de yema. Which now I have to try! Overall great recipe just needs more salt to flavour up those 11 eggs! I’m so glad you adapted it to your taste and enjoyed it! Hello, I was wondering if it is possible to see the video of how you make the bread. My father saw it twice on tv but I was unable to and he wants me to make it. I searched on YouTube but it is not there. Can you help me? I would very much like to see it. I’m so sorry to hear that Maria. Made these yesterday, January 2, and they are so delicious. They rise like a dream. Made some today and oh my gosh!!! So yummy!! I really enjoy your show and learn a lot from you!! Saw your show today, making this bread. I have chorizo seasoning for tomorrow’s breakfast. Can’t wait to try the bread!! Looked amazing! Oh enjoy the bread Stacey! Como preparo la masa sino tengo una batidora como la tuya. me encantaría hacerla se ve tan deliciosa. I saw your show last night and I will definitely make these for the New Year after church. They look delish. Hi Patty. I’m doing almost every food plate you makes. I’m so happy. Thank you for all delicious and easy food to prepare. Good show ever!!!!! I found the flavor to be bland. IF I go through all the trouble to make these again, I will add seasoning for a savory flavor. Sorry to hear this, Audrey. Hi Patti, I make this bread Savory, not add sugar, but teaspoon of salt.? I saw your cooking on create last Sunday like the look of the bread ,black beans and eggs . I need to find the recipes too. ​Hmmmm, bread dough can be capricious. It may have to do with the weather, it may have to do with ingredients… the important thing is: how did the bread come out? Can the dough be made the night before and stored in the refrigerator? Yes you can try… just bring it back to room temperature.